Swimming goggles are a great help to see underwater, and they come in various types. Each type has its own specs best suited for a specific purpose. This guide will help you learn more about goggles and how to choose best swimming goggles. How to choose the best waterproof fitness tracker for your lifestyle. 2.1 What do you need from your swimming goggles’ lenses? The Aqua Sphere Kayenne regular goggles are wide and weigh about 4 ounces. This goggle is made in Italy. It has an ergonomic design that promotes greater comfort. The curved Aqua Sphere Eye Protection technology design of the lens is patented. It aims to provide all swimmers’ needs, regardless if swimming in a pool or in the open waters. This is a great product for rough-water swimmers, triathletes, and the normal guy. This is among the best swimming goggles for toddlers, adults, and even triathletes. It is very comfortable, with a flexible gasket and frame made with silicon for maximum comfort. The lenses are made of polycarbonate, so these are shatter-proof. To further enhance the swimming experience, this goggles has very effective anti-fog coating with good UV protection. Lenses are clear, without any artificial colors or tints. 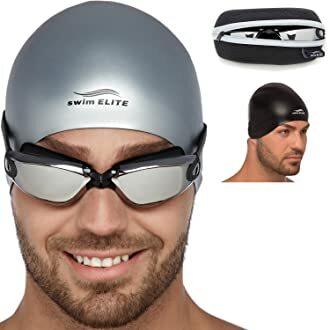 These goggles seem to be great for most swimming conditions. This is among the top selling goggles made by the world’s leading swim brand, Speedo. It gives 25% better peripheral vision compared to the previous version of the Vanquisher. The lens has a mirror coating and widest panoramic view. The lens also has effective UV protection and anti-fog treatment. This product has a sleek, precision fit that sits comfortably on most faces. This is among the best swimming goggles for adults. It has anti-fog and UV protection technology. The panoramic view is wide, allowing as wide as 180-degree views. The clear vision is attributed to the polycarbonate, optical-grade lenses. The optimal vision can be expected in both indoor and outdoor lighting conditions. This is a perfect choice for swim goggles for the youth, children, and adult men and women. The lenses are guaranteed anti-fog and anti-shatter. The lenses are also mirror-coated. Underwater vision is exceptionally clear. The goggle’s frame has an anti-leak design, so users will surely not be inconvenienced by water getting inside the goggles. The nose piece is smartly engineered so that it can fit all types of facial sizes and shapes. Quality swimming goggles made of high-quality PVC and silicone with a unique earplug attachment. Durable lenses and comfortable fit. This bundled product features one of the best swimming goggles on the market. Furthermore, it comes with a free swimming cap and a protective case. The goggle lenses have an anti-shatter feature, adjustable head-strap, and no blur and no glare finishes. The soft silicone frame and nose bridge of the goggles add comfort while protecting the eyes from irritation. The swimming goggles look good and have features that will add to the swimmer’s comfort (e.g. adjustable head strap, leak prevention etc.). It has a 100% UV protection lenses, making it usable for both outdoor and indoor swimming activities. The free swim cap is reversible, so you can choose between two colors (e.g. from clear black to grey). It comes with a protective case to store the goggles and cap when not in use. The bundle is cost-effective. Purchasing the limited offer means saving half of all the products’ costs. The head straps may not fit large heads as reported by some customers. RX Optical’s goggles has corrective lenses perfect for farsighted or presbyopic swimmers. 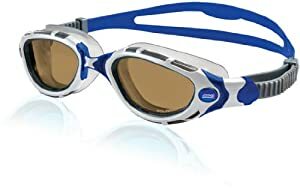 It is also one of the few prescription swimming goggles that offer customized eye strength options. This makes it is a good choice for those who need different strengths in their left and right eye. It also comes with 3 nose-bridge options for added customization. Its customized corrective lenses are attractive for those who need additional eye strength while swimming. The product comes with 3 nose-bridge options. The smoke color lens and anti-fog treatment provide further eye protection, alongside its 100% UV protection. The goggle straps are made of high-quality platina silicone. Some customers complained about its suction not functioning well. Free shipping means no case and no pre-assembly. The lens is made from 20% silicone (strap), 70% polycarbonate (lens) and 10% thermoplastic elastomer (TPE; seal). The lens is low profile and provides a clear view underwater. The side bridge system is unique and promotes a secure fit. The dual straps are made with silicone material, has easy adjustment features and 4 nose pieces that can be interchanged for a better fit. A great product for professional swimmers and divers. The Italian lenses are polarized and ultra-bronze. Users can expect glare elimination when swimming in the open water. The frame is very flexible, with 4 key flexible areas. This is brought about the 10 flex-point technology used. The curved lenses provide an expanded 180° vision underwater. Italian craftsmanship that is great for open water swimmers. Clearest vision while swimming underwater is to be expected from the lenses equipped with optical precision technology. Distortion is eliminated by the use of Aspherical and Flat Lens Technology. The silicone gaskets are soft and ergonomically designed to prevent any pressure on the eyes. This competition goggles is good enough for the world’s top swimmer, it is god enough for other, too. The goggles feature a curved lens technology that is patented. It has a low profile that is hydrodynamically efficient. This gives swimmers perfect clarity and a competitive edge. This effectively fights UV radiation and glare when swimming outdoors and in the open water. It provides 100% protection against UVA and UVB. The lens is scratch-resistant and anti-fog. Panoramic view is wide, at 180 degrees. This product has a great streamlined, anatomic shape. The Aphotic swimming goggles is first of its kind to utilize a photochromic technology. It means the goggles lenses can self-adjust according to the position of sunlight relative to the lenses. 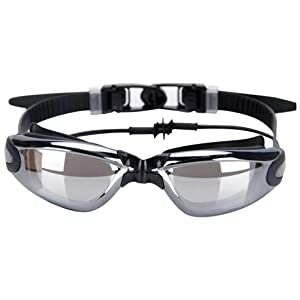 This technology gives swimmers additional clarity of vision, thus making it easier for them to move around despite the obstacles. Its photochromic lenses enable swimmers to maximize their vision while swimming. The technology also protects the eyes from strain due to overexposure to sunlight. It only takes approximately 60 seconds to go from dark to clear. Aphotic goggles is comfortable to use as it are made with a density of silicone and TPR to perfectly fit the face regardless of the swimmer’s profile. Some customers reported not being able to maximize their peripheral vision when using the goggles. Choosing the right swimming goggles is a personal matter. It is also a matter of preference. It is no different when choosing swimsuits for professional swimmers, earplugs for swimming, headphones for swimming, waterproof mp3 player for swimming, or waterproof fitness trackers for swimming. It all depends on you and what you want them to do. What do you need from your swimming goggles’ lenses? There are different types of lenses when it comes to swimming goggles, and they each have a different purpose. These are most probably the most common lenses around and are great for winter use or for overcast conditions. They work great when there is not too much light. These lenses, whether blue or yellow, are the favorite of open-water swimmers because they maximize underwater visibility. They are also great at reducing glare. Many competitive swimmers believe it gives them a psychological advantage, for some reason or other. Ultimately, though, colored lenses are a matter of choice, but they do help for some swimmers with specific visions issues. Colored lenses are also said to reduce stress on the eyes while swimming, more or less like sunglasses does when driving. 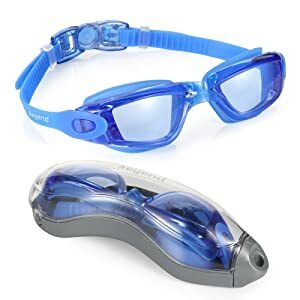 Prescription goggles are not really ‘true’ swimming goggles because they are made to correct your particular eye problem. They also come in different types, e.g. for open-water swimming, training, competitions, and the Swedish type (more on that later). 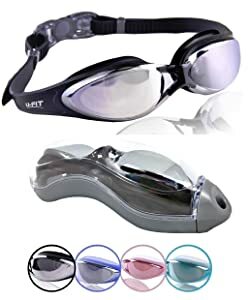 Tinted prescription swimming goggles, however, are not available, so you are a little limited as to style as far as they go. 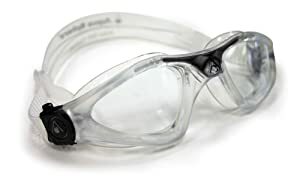 The most important thing about choosing the right swimming goggles frame is ‘what do you need it for?’ In other words, do you just want goggles to protect your eyes for leisure swimming, are you an open-water swimmer, or perhaps take part in competition swimming? Your choice of the frame depends on your answer. If you are a triathlete or open water swimmer, your main consideration might be the swimming goggles frame’s durability. These athletes need frames that are durable and can withstand all kinds of conditions, including rougher water as well as cloudy conditions or bright sunlight. So the question is, what kind of frames should I choose for my swimming goggles? These are often called frame goggles although they might be marketed as leisure of fitness goggles. These goggles are usually quite comfortable and the best choice for beginners, intermediate swimmers, and triathletes. 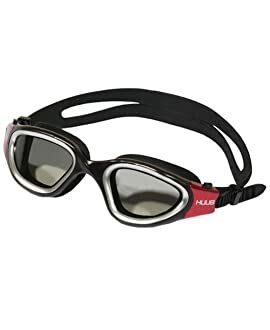 Many open-water swimmers also use this type of goggles. The lenses in these goggles are flat and mounted into sockets in the frame that and usually have a silicone gasket. The gasket is either a built-in part of the frame or an attachment so that you have a waterproof seal. The frame and nose bridge are normally one unit, while the nose bridge is not adjustable. Some swimming goggles do, however, come with an interchangeable nose bridge that fits most types of faces. The gasket helps your frame during rough conditions in open water, but it does become ineffective as a water seal over time. Although the clear or light colored frames allow in more light, they in no way enhance your visibility. Prices vary, depending on the type you buy and the kind of lens you choose. The lenses in these goggles are larger and more rounded and provide better visibility for all swimming conditions. It is the perfect choice for competition swimming and triathlons. Although it is also usually fitted with a sealing gasket, it is smaller than that of the leisure swimming goggles and not as hardy. These goggles look smaller and have different types of lenses, e.g. dark, clear, mirror, or colored. 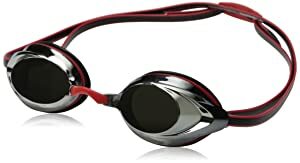 The tinted lenses are the favorite of many pool swimmers for competition purposes, and the nose bridge is usually adjustable. These comfortable goggles can withstand most types of rough water. The comfort they provide is a plus point during long training sessions. 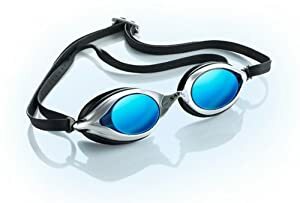 Swedish swimming goggles are also called racing or competition goggles. They are quite smaller than other types of goggles and very streamlined. This makes them perfect for swimming competitions in pools as they have much less resistance in the water. The lenses and frame are made out of a single piece of hard plastic. The seal is created due to the lenses sitting directly against the skin – these goggles do not have a rubber gasket. To make things easier, these goggles have to be personally fitted and assembled. They take some getting used to, but once you have your perfect fit, your visibility is unparalleled while they are very effective for the purpose they were intended. Swedish goggles are also extremely durable. Although the lenses and frame are important aspects when it comes to choosing the correct swimming goggles, the straps are of importance too. Swedish swimming goggles have simple, elastic, adjustable straps allowing you to conveniently get the perfect fit. Once adjusted, you need not worry about that aspect again. 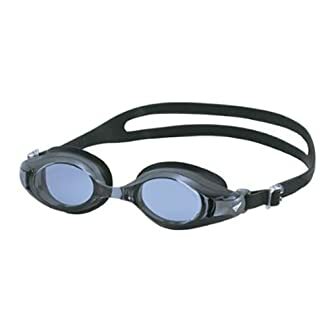 Most of the other types of swimming goggles, however, have a buckle system that needs adjusting, or a push-button system that makes for quick releasing. Yet others have a pull strap with a ratchet that makes tightening easier. In choosing the best swimming goggles, anti-fog characteristics should also be taken into consideration. This is generally a standard feature but it is always best to check. If the goggles do have anti-fog, this feature is not expected to last for long. The best way to ensure your swimming goggles last is to take care of them properly. Event the best quality goggles will not work as they should if you are rough with them. So how do I take care of my goggles? Goggles care is very important, as well as proper use. Even the best and most expensive goggles will be no good with improper use. Take these guidelines to properly use of swimming goggles. Hold the goggles by the lenses, against the eye sockets, with one hand. Pull the strap with the other hand, up over the head. Rest the strap against the back of the head in a comfortable position. The sides of the strap should be positioned right above the ears. Adjust the fit using the buckles on the sides of the frame. Slightly tug at the strap and insert a finger. Run the finger along the strap to remove any trapped hair. Hair can break the seal around the goggles. What is the best type for beginners? Any type can be good for beginners. The most important thing is that the goggles are comfortable and delivers the needs of the swimmer. Should children be given goggles? Most experts believe that children and any beginner swimmer should first get used to the water’s effects on the eyes. The swimmer, even children, should be able to see underwater without goggles. What goggles do is to enhance vision but the swimmer should not rely on it to see underwater. Goggles are so varied. It can easily get overwhelming when choosing the best swimming goggles. However, with the right knowledge and good background of the best brands and types, choosing should now be a breeze than before.